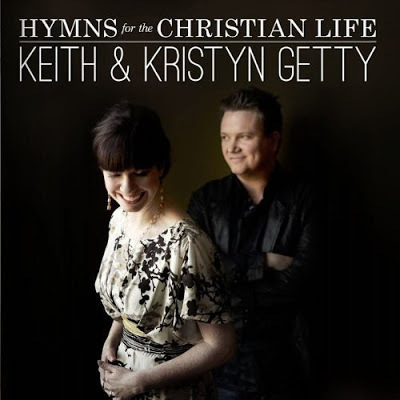 We interrupt our regular broadcast to bring you news of a new album by modern hymn writers, Keith and Kristyn Getty: Hymns for the Christian Life . Keith and Kristyn Getty might be familiar to you. Keith Getty is co-author of the modern hymn, In Christ Alone. They have a host of songs which they have written and there are very few which I do not like. This new album, Hymns for the Christian Life definitely deviates from their usual sound and focus. This album has a strong celtic/Irish flair to it. Instead of hymns which are designed to sing in a corporate worship setting (i.e., church), these songs are meant to explore worship "outside of the pew" - in our daily lives. There are hymns about motherhood, money, work and other things we have to deal with in our daily lives. Some songs make you want to dance a jig and others bring you to your knees in worship. Since that rather describes life - full of ups and down - I think this album is rather awesome. It's not what I've come to expect of them but it's very fitting all the same. On a journey of your own. This next one might be my very favorite on the album. Maybe. It is a very HAPPY song! Although this album is different in vision and focus than their work has been in the past, I still like it and find it a great boon in my Christian walk. And I'm just so excited about their new album that I had to tell you about it - not to say, "you should like this TOO!" but just to share songs which have spoken truths to my heart. If they can minister to you as well - then wonderful! I was not given a copy of this album for review. Rather, my husband realized it was coming out and surprised me with it! I love that man! We became acquainted with their music through the Steve Pettit Evangelistic Team, which sings a lot of it. There is such depth to their lyrics. Our church stays with the same opening song for 4-6 months and then changes, and lately it has been The Perfect Wisdom. Love that last verses especially. God blessed you just right with J! I had not heard of them, but of course I know (and ♥) In Christ Alone. Thanks for sharing the clips, too! Nice! My Mom has recently discovered that she really likes the Getty's music. Perhaps this is a good gift possibility. Just sent T a link to this album. We saw their Christmas tour last year and it was breathtaking. Thanks for the head's up on the album! Thanks for posting this, Carrie. I enjoyed listening to the clips and bookmarked it for additional future listening. I'd never heard of them until about a year ago when a friend invited me to come to a concert of theirs. Alas, I opted not to spend that $15. Beautiful music, though!